I'm glad to see that v2 will show these differently. I was just looking at the 3040a that I have and came up with a functional difference. If you put a 3040b on a jumper, it can only go in 3 positions. It can rotate on these 3 fixed positions, but it cannot go to an intermediary position. A 3040a can slide into numerous positions and rotate. I'm thinking about trying this as a "switch" for the light bricks in the Winter Village sets next Christmas. If I want the light on for a few minutes, I can slide the 3040a up against it and then slide it back when I want to turn it off. Suggestion to make the title Slope 45º 2 x 1 to match with alphabetical ordering of other slopes. Also, there are a number of special print slopes that need the same adjustment...would you like me to tag them to save you all some time? Agreed this is messy and I hadn't noticed. Unless you REALLY want to tag 'em, they're in the scary long list and get sorted as LDraw and/or LEGO images get added. Whenever I look at a set with a print in it gets fixed where possible, but if you have favourites for MOCs or whatever I'll fix asap when asked [if possible].<br>EDIT:- OK my OCD kicked in, all slopes in the 'brick sloped' category done. I just come across these things as I input large bags of parts. I'll continue to tag if you feel it's helpful! Yes, keep it up, there's stuff I never see day to day set fixing, thanks! Okay went back to the discussion on 3040. 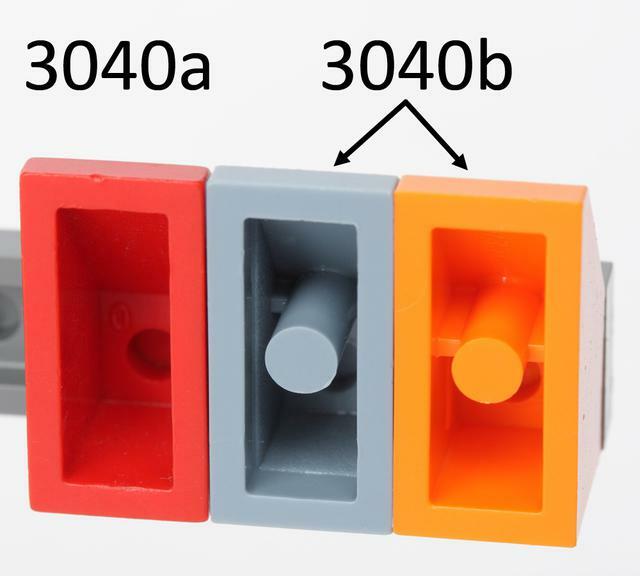 I still think it's confusing to have a 3040'b' as a catch all when it really should be the 3040, that is how bricklink handle them. and the lack of 3040a sets is also weird the engine should list the exclusive set there aswell. The #1 purpose of Rebrickable is to show people how to reuse their parts. I believe the 3040/3040a/3040b for all intents and purposes can be treated as the same part. The 3040a without tube is old enough to be inconsequential. There may be a slight functional difference between the parts, but given their age I am happy to map them all together. As for using 3040b instead of 3040, that is because I've adopted the LDraw parts numbering scheme and not Bricklink. Edit: The new direction is to keep all molds separate and the v2 functionality will handle it! If I am not misstaken doesn't LDraw have generic pieces, you have to pick either, if there is two or more mold of a piece. 3040b might be the default choice, but that isn't the same as a generic choice. To make a good system that allow new features the generic part should be the part without a extension. or you will endup with a mess when trying to make new features like build independent of mold. ie you need to define which part that is the "generic" for each piece instead of having a generic solution that tells that the number part is the generic choice in all cases. So I think you should display 3040a sets under 3040a instead of 0 sets. and 3040b as all new sets not containing 3040a. while 3040 is all sets containing either 3040a or 3040b. The part might be old so most people have only part 3040b, I have alot of both. Some part mapping has to be done thought for it to work 100%. it's one thing I think it's bad about rebrickable to treat old pieces as if they where second class bricks. That most of them end up in "other" catagory without images. Okay i can understand the images, you have to work from one end and focusing on new parts make sense. I also think you need more categories. my inventory is getting unweilding already and I have alot of inventory to add. Older bricks are not treated as second class bricks. They have no images because the images are automatically generated from the LDraw models, and older bricks simply are not used regularly enough to have LDraw models created for them.<br>It's the same reason that you don't see 17 Model T Fords on the road every time you drive to work. There are still some around, they are perfectly usable and functional, but have been gradually replaced by newer designs. Just like the old bricks. I would certainly like [and I think Nathan would too] every single item here to have a nice shiny image, but I'm realistic enough to recognise that that probably isn't possible, sadly.<br>If there is a part in the other category you think should be in another category just mail in a request. I always move items I think should be in another category when I see one that's obviously wrong.<br>I can only re-iterate what Nathan said - Rebrickable concentrates on reuse of your bricks, and the 3040s are entirely interchangeable. 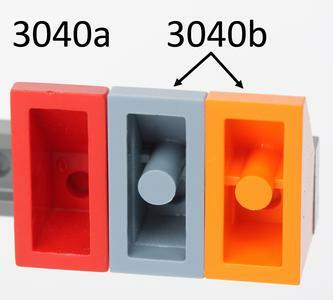 As far as I can tell Lego never used the pinless 3040 in a set in a way that can't be replaced by a newer 3040. Really I got 150 parts in the other category. 103 of them fits in the brick category. 8 of them in plates, 2 in wings. and the brick category is already on 320 items as it is, I need more categories this webpage is getting sluggish because it tries to fit to much into one place. Has anyone made a Blender exporter to LDraws format? it's easy to make some of those 3D shapes. The 3040 ldraw model has been deprecated and it's description is "~Moved to 3040b". You describe some nice to have features which Rebrickable does not handle yet. Maybe one day :) Also I'm aware that the My Parts page is quite slow when you have a lot of parts in your collection. One more thing on my todo list. Yeah but if you ever want those feature you need to approach current work pattern to make them possible rather then making them harder. Wouldn't more categoreis help from the slow down. (like slopes and the sub brick categories bricklink has)I also have notice that if you completely reload the "parts" page it recover speed while every time you use the "update button" or modify your current part without going up in the adress field to force a fresh reload it slow down bit by bit until it's not even possible to scroll anymore. With that information you should beable to figure out a counter measure. oh and this site could use a forum. Can someone please explain the idea here. 3040a has for some reason no sets and this 3040b seem to be both bricklink 3040 and 3040a together. and then we have 3040 with a few set alone. I could have understood it if 3040b was with pin, but the both should be on the 3040 without extension, not on a subgroup like this. It's confusing. Is this some kind of work in progress?, a step towards a none mold rebrickable?